We don’t like to brag but we pride ourselves in being the best Ocean City parasailing experience! Because we are not the typical large operation that is focused more on getting large numbers through like a factory we can provide a much more enjoyable parasailing ride by making it fun. Our crew focuses on making sure you have a good time while keeping you safe. Island Parasail is the best on the beach! Your safety is our top concern, we go to great lengths to ensure your experience is not only a fun one but a safe one. We explain everything that will happen during your ride and what to do in the unlikely event that something does happen before your ride starts. We have backup safety features and safety procedures that keep you safe. Our crew is well trained in keeping you safe while having fun! Your Ocean City parasailing experience will be great! At 400, 600 and 800 feet in the air you are truly getting a birds eye view of Ocean City and the Atlantic ocean, the breath taking views will truly take your breath away! 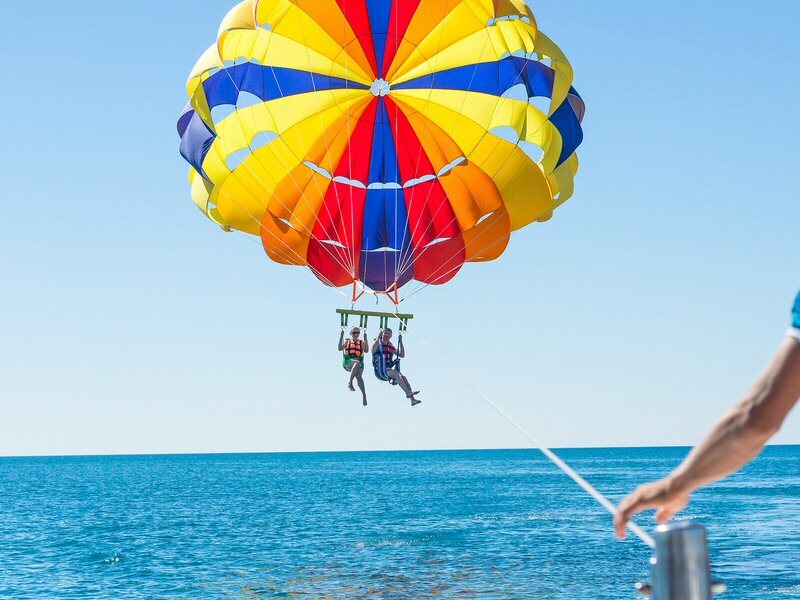 After you enjoy the great views and it is time to come back to earth riders have the option of getting dipped in the water on the way back in, just let us know ahead of time and we will make sure you get the best Ocean City parasailing experience from your ride! Longest Parasail Rides and Best Ocean City Parasailing Rates! This is a tandem outta this world flight at 800 ft. This is a tandem Middle of the road flight 600 ft. This is a tandem Lower rider flight at 400 ft.
Online coupons are not valid with any other coupons or offers. If you are searching for the Best Ocean City Parasailing on the beach you can stop looking and call us at 410-289-2144! !